Too many kitties is never enough. Too Many Kitties is a 265 word Easy reader with seek and find activity page. About a boy's love and care of his kitties for ages 3-8. 16 chalk illustrations. Too Many Kitties is a darling soft-cover easy reader written in rhyming prose that's chock full of colorful illustrations of kittens. 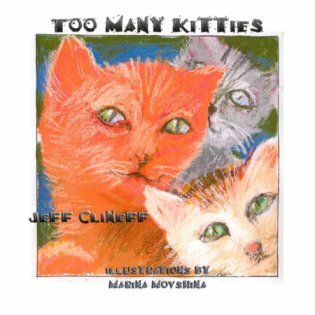 This is author Jeff Clineff's debut children's book that came out in August 2007. The storyline is about a day in the life of a little boy who has 3 kittens with distinct personalities, and how the boy interacts with them throughout the day. It's a gentle book about the boy's commitment to his kitties, and how he loves the animals and takes care of them. I enjoyed all the antics the kitties did throughout the story, which will endear this book to young readers everywhere that have a love of animals, especially cats. The last page of the book has a "Picture Seek and Find" Activity section for the reader to enjoy. Marina Movshina's chalk drawings are colorful and animated - sure to catch the eyes of the very young. I found it a fun read and highly recommend it to parents looking for a peaceful yet beautiful book with excellent lyrical flow to it. Author Jeff Clineff did a terrific job with just the right wording. Too Many Kitties is my first of what I hope will be many books. It came out in August of 2007 and was released by Guardian Angel Publishing. It is based on three of the cats my wife and I have had over the years - Gracie, Skipper and Maxx. The book can be ordered through Guardian Angel Publishing , Amazon and Borders, as well as a number of other different outlets.